We’ve all used conventional cleaning products and looked at the label and wondered what exactly those ingredients are. After that, however, we don’t give it much thought. Using green cleaning products instead of conventional products has its pros and cons, and it’s important to consider different kinds of cleaning products. Green cleaning products can actually be pretty hard to find. Some companies have pledges not to use knowingly harmful chemicals in their products, so these are the best products to buy if you’re looking to clean green. Most green products advertise they are green and don’t use harmful ingredients. They also list all ingredients on the label so you’ll know what is in them, unlike some other products. Some “green” products aren’t as green as they claim though, so always check labels and stay away from products that don’t disclose what’s in the product. The only product that can’t really match is chlorine products such as bleach. These chemicals aren’t necessary to cleaning, though. They just make the job a bit easier. One of the many benefits of green cleaning is that green products won’t damage surfaces over time like traditional products can. They are also better for the environment if you are using something that needs to go down the drain. Remember, what goes into our water and food systems eventually comes back to us! They also have no harmful effects if you accidentally come in contact with them to your skin or eyes. In the long-term, you are less exposed to toxins which is better for your health. What Can I Use Around the House? Generally, everything in your house can be cleaned with baking soda and vinegar, which is completely harmless to you and the environment. Although this does require more time and will power, it is one of a couple very inexpensive alternatives to green cleaning products and is better for the environment than the traditional chemical cleaning products. You can easily make a variety of green cleaning solutions at home though like blogger Logan’s natural laminate floor cleaning solution! 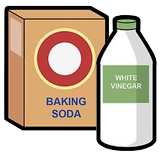 Doing a half and half mixture of baking soda and water makes a great antacid for cleaning many different surfaces, while a half and half mixture of water and vinegar leaves a good finish. Pondering How to Spend Your Tax Refund?